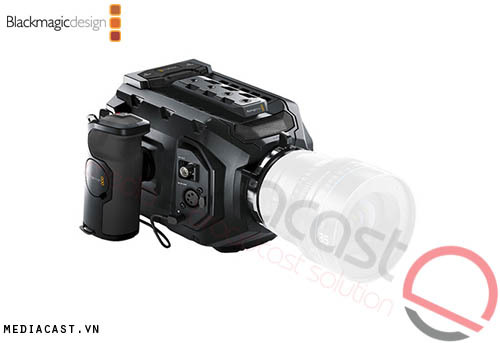 Blackmagic Micro Cinema Camera là máy quay điên ảnh kỹ thuật số nhỏ gọn, sử dụng cảm biến Super 16mm-sized, độ phân giải 1080p video dải nhạy sáng 13 stops, quay được tới 60fps. Máy quay sư dụng thẻ nhớ SDHC/SDXC để ghi video 12-bit CinemaDNG RAW, hoặc 10-bit Apple ProRes codecs. 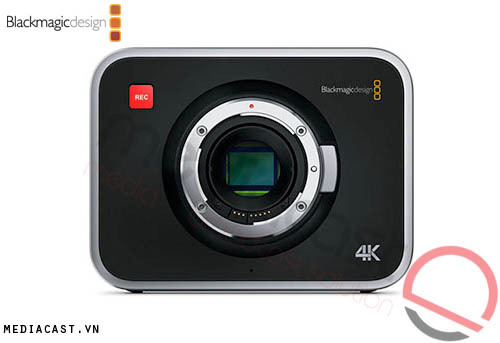 The Blackmagic Micro Cinema Camera is a miniature digital camera with a Super 16mm-sized sensor designed to be operated remotely and capture footage from virtually anywhere. 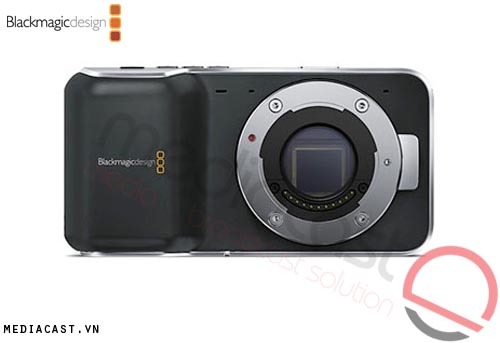 It features the same image sensor found in Blackmagic's Pocket Cinema Camera, which supports 1080p video and 13 stops of dynamic range but adds a global shutter that supports frame rates up to 30 fps. Frame rates up to 60 fps are possible using a rolling shutter. The camera is equipped with an active MFT mount that can accept native MFT lens or be adapted to a wide range of other modern and vintage lenses using optional third party adapters. Video is recorded to SDHC/SDXC memory cards using the 12-bit CinemaDNG RAW format or 10-bit Apple ProRes family of codecs. Compact in size, the Micro Cinema Camera is similar in size and shape to an action camera, making it well suited for mounted on helmets for POV action sequences, suspended from quadcopters for aerial shots, or any place where a larger camera can't fit. To facilitate camera control when the camera is mounted in impossible-to-reach locations, you can operate it remotely and view a live video feed thanks to the camera's expansion port. An included breakout cable supports four analog PWM radio remote control inputs, so you can map camera functions to the dials, knobs, buttons, and joysticks on model airplane remotes, such as start/stop recording, focus, and iris (with compatible MFT lenses). For more control, you can use the 18-channel S.bus control input with Futaba radio control equipment or custom embedded controllers. In addition to radio control support, the breakout cable also provides LANC control, power, genlock, and composite video output for connecting to wireless video transmitters, letting you see what you're recording while remote controlling the camera. For higher quality monitoring, the camera has an HDMI output. For remote recording, you can attach a Canon LP-E6 type battery to the back of the camera to power is for up to 1.5 hours. One LP-E6 battery is included. The camera also has a 12V DC input via the breakout cable for powering the camera from external power supplies for longer shooting times. 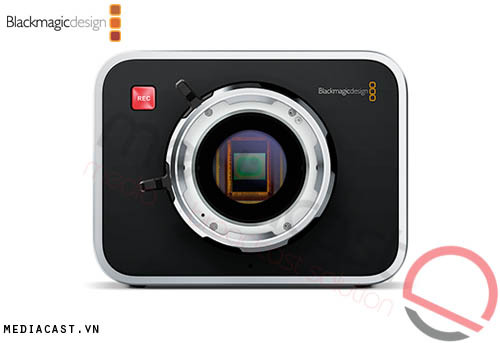 With a compact miniature design of the Blackmagic Micro Cinema Camera combines advanced miniaturization and a unique expansion port in a digital film camera that lets you create personalized rigs for remote operation and monitoring. Use it like an action camera for high-quality POV shots, or using it with a quadcopter for stunning aerial shots Its core is made out of a lightweight magnesium alloy that makes it durable enough to shoot anywhere. You can control the Micro Cinema Camera directly from the front buttons when it's mounted, or remotely when it's out of reach. The Super 16mm-sized sensor delivers 1080p video with a film-like look with a wide dynamic range of 13 stops. This means you retain all sensor data for DaVinci Resolve color grading. Plus, you get two dynamic range settings, Film Log or Video REC709, so you can choose the right dynamic range for your project. Using DaVinci Resolve Lite, which can be downloaded free from Blackmagic Design's website, you can color correct files natively or transcode them into a different file format to suit your post production workflow. 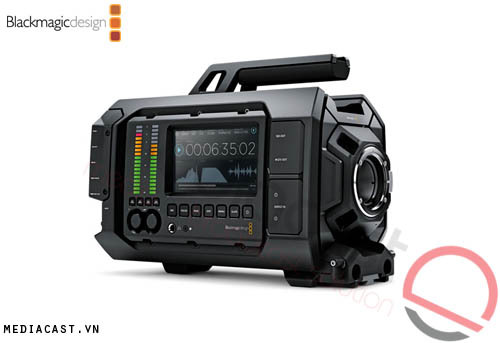 The Super 16mm-sized sensor supports 1080p resolution and has 13 stops of dynamic range and global shutter for up to 30 frames per second (60 fps when using a rolling shutter). Most DSLR and action cameras use a rolling shutter that exposes different parts of the image in fractions of a second, causing video to appear skewed or wobbly when the camera moves or vibrates. The Blackmagic Micro Cinema Camera's global shutter acts more like a still camera, exposing the entire image at the same time so you get distortion and ripple free video. The Blackmagic Micro Cinema Camera features an active Micro Four Thirds lens mount let lets you take advantage of the wide-range of native prime and zoom MFT lenses available. The focus, iris, and zoom on active MFT lenses can be controlled remotely from the camera's expansion port. Many MFT lenses also have built-in optical image stabilization, making them perfect for use in places where there might be a lot of movement, shocks, or vibration. If you don't need electronic control, you can also use optional third party adapters to use a nearly endless selection of modern and vintage lenses. The camera records to SDHC/SDXC memory cards in either in either CinemaDNG RAW or ProRes. Cinema DNG RAW files are 12-bit log and give you all of the data from the camera's sensor, so you have the latitude to change things like white balance and exposure long after the camera stops rolling. If you need smaller file sizes and longer recording times, you can use the 10-bit ProRes family of codecs to get broadcast quality images. Both formats can be easily edited and color corrected with the free DaVinci Resolve Lite software for Mac and Windows. The DB-HD15 expansion port lets you create custom remote control, external power, and monitoring solutions. The included breakout cable gives you access to many of the camera's unique functions. In addition to LANC, power, video out, and genlock, you also get four analog PWM radio remote control inputs so you can map camera functions to the dials, knobs, buttons, and joysticks on model airplane remotes. For even more control with greater precision, you can use the 18-channel S.Bus control input with Futaba radio control equipment or custom embedded controllers. The expansion port includes NTSC and PAL composite video output that can be connected to cost-effective wireless video transmitters for remote monitoring. That means you can see exactly what the camera is recording whether the camera is in the air or hidden on set. 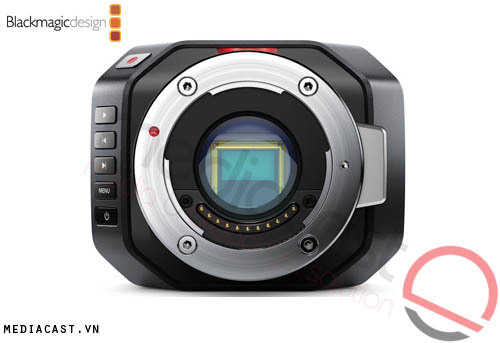 For higher quality monitoring, the Micro Cinema Camera also has an HDMI output for wireless HD video transmitters and direct wired connection. Both the composite and HDMI outputs can display overlays for camera status, lens settings, file formats, histogram, audio meters, battery life, and more. The camera's built-in stereo microphone is omni-directional and features a mechanical design to help reduce unwanted wind noise so you get a clear recording. There's also a built in 3.5mm input connector so you can plug in an external microphone. The 3.5mm input jack supports both mic or line level devices and automatically disables the internal mic when an external one is connected. For remote recording, you can attach any readily available LP-E6 battery to the back of the camera to keep it powered for up to 1.5 hours. The battery level is shown in an overlay when the camera is connected to an HDMI display or on the PAL/NTSC video output so you can monitor battery levels even when the camera is operated remotely. There is also an LED on the camera to indicate low battery condition as well as record status. Additionally, the included breakout cable has a 12V DC input jack so you can use external power supplies to keep the camera powered longer. You can quickly adjust camera settings using the row of buttons located on the front of the camera. Because they're on the front, the buttons are always accessible, whether the camera is strapped to your body or mounted in tight locations. Camera settings are displayed on an external monitor using the HDMI or composite video output. You also get power, record, stop, fast forward, and rewind buttons, along with an LED light on top that shows recording status and has memory card and low battery warning indicators.